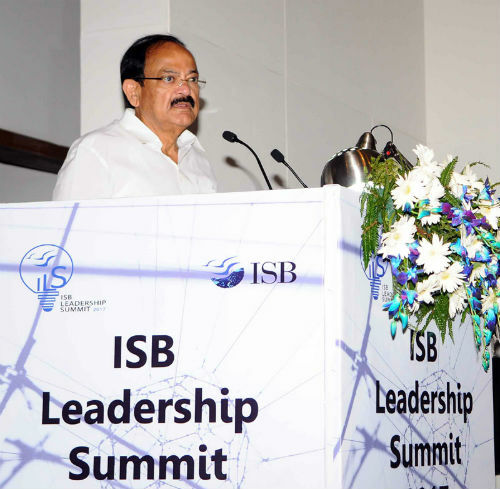 Mohali: The Vice President of India, Shri M. Venkaiah Naidu has said that aspiring business leaders should to build a culture of inclusiveness and shape their actions to have a positive impact in the lives of those who need support. He was addressing the gathering after inaugurating the 15th edition of ISB Leadership Summit 2017 at the Mohali campus of the Indian School of Business on the theme “Transforming Tomorrow: The Future Unraveled”, in Mohali, Punjab today. The Governor of Punjab & Administrator of UT Chandigarh, Shri V.P. Singh Badnore, the Minister of State for Civil Aviation, Shri Jayant Sinha and the Minister of Health & Family Welfare, Research & Medical Education, Parliamentary Affairs, Government of Punjab, Shri Brahm Mohindra were also present on the occasion. The Vice President said that an area of concern has been the growing inequalities and exclusion of certain sections of our population. He further said that we must be attentive to these trends and see that we build a culture of inclusiveness. He advised the ISB students that the antyodaya approach advocated by Gandhiji, Dr. Ambedkar and Deen Dayal Upadhyayaji should serve as our guiding principle. The students must listen to diverse voices, especially those which are feeble and almost inaudible now, he added. The Vice President said that the students should break new ground. He further said that innovation, thinking outside the box and accessing knowledge from across the globe and adapting it to our country context would be crucial. He also asked them to mindful of the ethical dimension while building the physical, material and intellectual wealth. Let us remind ourselves of what Gandhiji had said about the means and ends, he added. The Vice President called for a collective resolve to root out corruption and undesirable elements like communalism, casteism, fundamentalism, criminalization of politics, gender discrimination and atrocities on women and weaker sections. We must recognize the devastating impact of terrorism and launch a coordinated strategy to root it out, he added. The Vice President pointed that there was a general recognition, echoed in the assessment of the World Bank in 2017, that India is the fastest growing economy in the world, and said that it was time to capitalize on the demographic dividend by enthusing, equipping and empowering youth who constitute 65 per cent of country’s population. The Vice President said that while the country could be legitimately proud of what was accomplished so far, the India of tomorrow will have to be a country which would translate the dreams of our freedom fighters into tangible reality. – It will be an India that will transform the quality of life of the citizens. – It will be an India that will internalize and live the values of democracy and inclusion as a way of life. – It will be an India that places ‘people’, especially those who are the poorest of the poor at the centre of the development process. 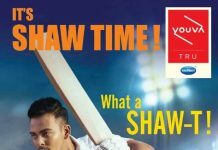 – It will be an India that encourages each Indian to realize her or his own potential. – It will be an India where women get equal opportunities along with men. – It will be an India that will foster innovation in all spheres. – It will be an India that will celebrate its infinite diversity and rich cultural heritage. If this is the future India we wish to unravel, we have to build it individually and together, he added.